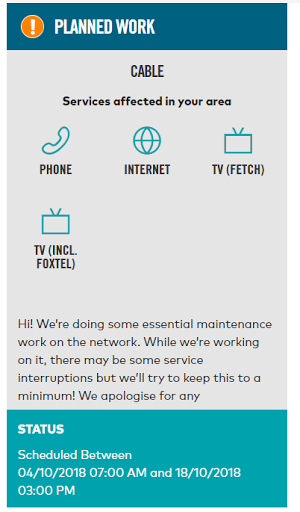 The last week or so there has been constant dropouts on my NBN connection. And before you say check the line, reset blah blah, they are related to the Optus DHCP server not responding. Doing some debugs/packet captures I can see the DHCP release and renews not being answered, but the line is up. According to the outage thing they ar edoing work to the Cable services. Does this include NBN over HFC? I'm connected to teh St Kilda POI. AussieBB had a similar problem and their solution was to move to a 10min DHCP lease. Why is Optus on a 5min lease? Can the move to a longer lease which would cause fewer problems. Anyone at Optus with some tech nouse have any suggestions on why their DHCP server seems to keep dropping it's load? Hey @know1 - My understanding is this would only be impacting Cable, not NBN HFC, that being said I'll still investigate further. Can you please send me a private message with your full address?